In this post we are going to look at one of the first stages of building a successful idea management programme: leveraging the crowd. Businesses and institutions have been using crowdsourcing for years through focus groups, surveys, consultations and interviews to gather feedback and suggestions. 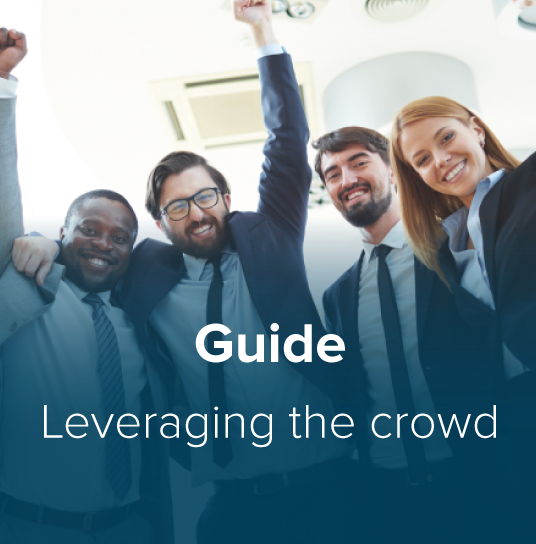 Although the terms “crowdsourcing”, “open innovation” and “ideation” can sound complex and novel, they are merely new methods of engaging larger crowds to gather ideas and input. A “crowd” now entails a richer variety of internal and external stakeholders. Public and private organisations are increasingly seeking to engage with employees, suppliers, partners and local, national and global communities. For a growing number of organisations crowdsourcing is a very exciting concept and they are integrating it fully into their innovation strategy. The term “innovation” actually suggests new processes and strategies. However, these organisations must be able to efficiently leverage their crowd’s input. Crowdsourcing implies a larger stream of ideas flowing into and through the organisation. The idea management process can seem long and complicated and organisations must learn to source fresh ideas from new contributors and how to effectively manage the ideas once they have been gathered. Innovation tools such as Wazoku’s Idea Spotlight platform facilitate that process. Where a lot of businesses and institutions concentrate on engaging with customers and the public and can sometimes overlook the innovative potential that lies within the very borders of their organisation, others are focusing solely on their employees to source ideas. Internal and external contributors are equally important and where possible engaging both groups in solution generation is essential. All stakeholders need to feel involved in the organisation’s innovation strategy. Crowdsourcing is being used for new product development, process and service innovation, employee, community and network engagement. Employees and stakeholders who are involved in an organisation’s idea generation and decision-making processes inevitably become happier, greater brand ambassadors and advocates. In one of our previous posts we mentioned that the more engaged organisations are, the more productive they are. This engagement, which is a positive experience for employees and stakeholders, ultimately leads to sustainable relationships. The Ministry of Justice is crowdsourcing ideas and opinions to engage members of the public and help shape future policy; and the Institution of Engineering and Technology needed to engage 150,000 international members across 127 countries, to manage large volumes of ideas and feedback and to tap into the potential of its members’ ideas. To learn more about what to expect when you set up an idea management programme for government, download our guide “Getting Started the First 90 Days – Government Guide”.